The evidence is incontrovertible: Phoenix Wright: Ace Attorney is getting a film adaptation. Several days ago, we reported that veteran Japanese director Takashi Miike had announced that his next project would be a light-hearted courtroom comedy based on a Nintendo DS game. Naturally, we thought of Capcom's excellent Ace Attorney games, though there was no way to be sure. Now, however, we're sure. Capcom has confirmed that Phoenix Wright will be going to the big screen - in Japan, at any rate. As previously reported, the film will be directed by Takashi Miike, who is best known for ultraviolent fare like Ichi the Killer and Audition, but who has also directed kids-friendly movies like the live-action Yatterman adaptation. 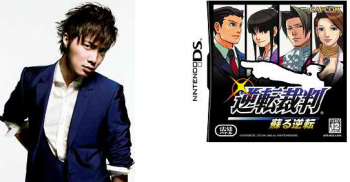 It will star Hiroki Narimiya as defense attorney Phoenix Wright (or "Naruhodo Ryuichi" in Japanese), Takumi Saito as his erstwhile prosecutor rival Miles Edgeworth (Mitsurugi Reiji), and Mirei Kiritan as assistant, sidekick, and spirit medium Maya Fey (Ayasato Mayoi). The film will be distributed by Toho Co., and is scheduled to hit theaters in Japan next spring. The Phoenix Wright games are some of my favorite games of all time, so a film adaptation has me a bit giddy. Presumably, this is just an adaptation of the first game in the series, since no casting has been announced for the other primary prosecutors. Either way, though, if they can do the Ace Attorney games justice in film, I'll be a very happy camper.